For the many Israelis and tourists who choose to go down to Southern Israel for a vacation, it is slightly upsetting to learn that it can be difficult to find kosher restaurants in Eilat. However, the good news is most, if not all, hotels have at least one Kosher restaurant inside. 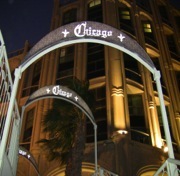 Two hotels that are most well known for their Kosher restaurants are the Hilton Hotel, home to the Chicago Grill Bar, and the Isrotel King Solomon, where the Marina Grill is located. The Chicago Grill Bar is an elegant and modern restaurant and bar. I ate there twice. They proudly state that they get their meatstraight from the Golan Heights. The first time I went for dinner, I ordered the Lamb Kebabs, which were grilled on cinnamon sticks with roasted aubergine and green tahini for my appetizer. While it was very tasty, I felt that the chef used a little too much pepper. However, as this is Israel, where the food is generally more heavily spiced, I am sure he used what he perceived as the correct amount. For the main course I ordered a hamburger. The burger was very large and very tasty. They served it with a sweet coleslaw, portobello mushrooms, French fries and multiple dressings. Everything was made to perfection. The second time I ate there, I ordered their mushroom ravioli in olive oil, dressed with tofu cream and walnut scented truffle for my appetizer, and a trio of steaks for my main course. The trio of steaks were of three different cuts. Your meat options depend on what they have available at that particular time. I had an angus, a fillet, and their own version of a New York Strip. They serve it with a side of wedged potatoes that were also seasoned perfectly. While strolling on Eilat’s boardwalk near the marina, I discovered the Marina Grill, an excellent Kosher restaurant, quite by accident. As its names describes, the restaurant is located on the Eilat Marina in the Isrotel King Solomon, one of the last hotels on the Marina. 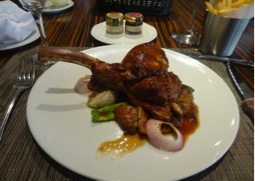 The restaurant boasts choice cuts of meat, unique starters, and a variety of dishes that will appeal to almost everyone. 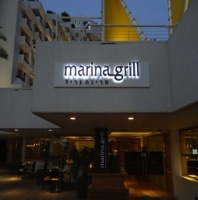 The Marina Grill combines the tastes of French, Mediterranean and Israeli cuisine. For my appetizer I chose a goose fois gras, which was seared on the grill with glazed chestnuts and port sauce. To add to the experience, they served the goose liver with a nice glass of chilled Muscat wine which complimented it well and added to the overall dining experience. served au jus with market vegetables. Usually it is made large enough for two people, however, if you ask they will make it just for one. 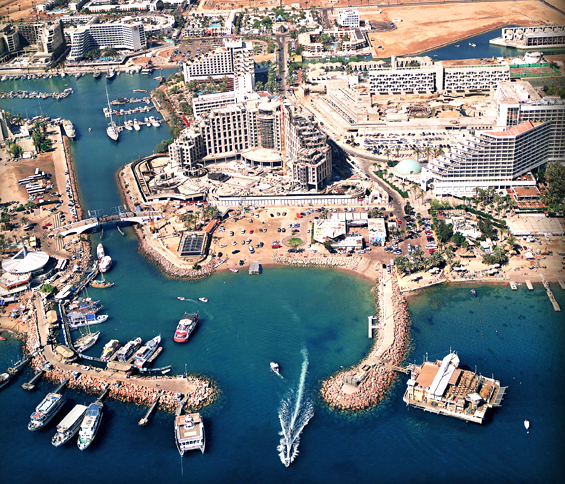 All hotel restaurants in Eilat are under the kashrus supervision of the local Eilat rabbinate.